Tinea Versicolor is a type of skin fungus (or yeast) that can exhibit similar symptoms to Cholinergic urticaria. In fact, many people suffering with tinea versicolor sometimes mistakenly diagnose themselves with cholinergic urticaria, and some with cholinergic urticaria may mistakenly diagnose themselves as having tinea versicolor. Cholinergic urticaria is often idiopathic (meaning doctors aren’t sure what’s causing it). Tinea versicolor is a well-known fungus/yeast. Cholinergic urticaria is often treated using antihistamines, however, treatment is often on-going since the condition can persist for years (or even the remaining life span once aquired). Tinea versicolor can be easily treated using topical solutions (selenium sulfide), or oral antifungal medications, and will usually go away. Cholinergic urticaria is a type of physical hives which affects the skin. Tinea versicolor is a type of fungus. Tinea versicolor often leaves subtle spots of hypopigmentation (dry, scaly patches). Cholinergic urticaria skin usually appears normal (although during a hives reaction it will form small pinpoint hives). Both cholinergic urticaria and tinea versicolor can cause a “pin prick” itching sensation when the skin is warm, or when sweating is initiated. Both conditions commonly appear on persons aged 15-60, however, it most commonly appear during the late teens or early 20’s. Both conditions can go into remission and reappear over a period of time. One of the symptoms listed is a “pin prick” feeling when a person becomes hot, which is relieved once the individual sweats. Nearly everyone has this one their skin (it is naturally found on our skin), but only becomes overgrown in certain individuals (such as those with weakened immune systems). People in forums were talking about having this condition, and most got itchy when they got hot. 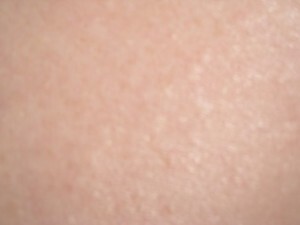 Human peptide cathelicidin LL-37 plays a role in skin defense against this organism. Vitamin D plays a vital part of the creation of cathelicidin LL-37. I have a few errands to do. Just make sure to tune in tomorrow for the rest of the story before trying anything. i will detail my treatment and talk about it in more detail.